You can access an assignment in SpeedGrader directly from the Gradebook. 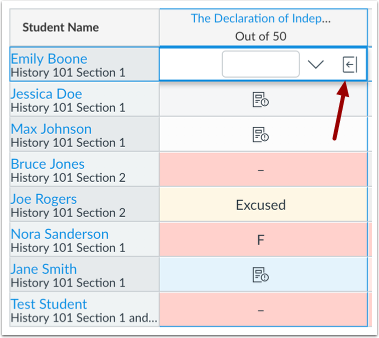 SpeedGrader displays assignment submissions according to the current Gradebook settings for inactive enrollments and concluded enrollments. When a section filter is applied in the New Gradebook, SpeedGrader also displays assignment submissions for the same section. 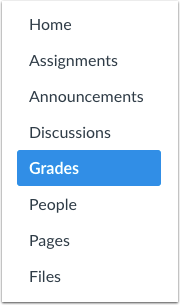 Click any assignment cell and click the Grade Detail Tray icon. Previous Topic:How do I enter grades for an individual assignment as a specific grading type in the New Gradebook? Next Topic:How do I curve grades in the New Gradebook? Table of Contents > New Gradebook > How do I get to SpeedGrader from the New Gradebook? It should be made more efficient to find the speedgrader in the new gradebook. Appreciatted the feature in the "old" gradebook where speedgrader was found by clicking "down arrow" at the name of the quiz. It is now the only way to find speedgrader for quizzez.next, so I hope it will be done something with this. I know it's only been a short week since we replied to your comment, but I wanted to reach out and make sure that you were able to locate the SpeedGrader feature ideas that Nathan referenced. If you have any other questions or concerns, please let us know. In the meantime, if we don’t hear from you, we’ll eventually archive this comment thread. We do this periodically to keep our guides updated and tidy. We’re always happy to help, though, so let us know if you have any other questions about Canvas.